Here's something new. 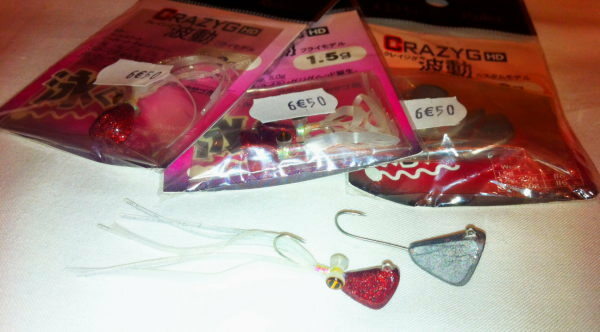 Ocean Ruler's CrazyG HD jigs and jigheads were one of my favourite finds at the 2012 Nantes tackle show. As far as I know, the Ocean Ruler brand is owned by a Japanese tackle manufacturer called Tsuriken - known for innovation. The French tackle show was the first time I'd consciously come across the brand. Interestingly, in France, it looks like the Marukyu/Ecogear distributor is importing them in. The jigheads are a perfect match for small rockfish baits like Power Isome and Ecogear Aqua Straw Tail Grubs. The jigheads are available naked, featuring a longer than average hook shank that I feel will be great for artificial worm baits. The dressed jigs are tiny items of beauty. The heads are finished in a lush, metalic paint, embossed with the Ocean Ruler logo and the weight in grams. A small holographic body is adorned with a pair of custom 3D eyes, and the tail is finished with two types of quality latex material (one shaped). It's easy to believe that the finished article could trick any fish into thinking it was a small cephalopod or a fleeing shrimp. Size-wise, there are quite a few variations in weight and hook sizes. Hooks range through #4, #6, #8 & #10, while available weights are as follows; 0.8g, 1.0g, 1.2g, 1.5g, 1.8g, 2.2g, 3.5g & 5.0g. Absolutely can't wait to try these out, further into the season. I've got the dressed jigs in red & white, in 1.5g & 2.2g sizes. And with the jigheads I've got the big 5g ones ready to try on the boat.